The head of Hezbollah in Lebanon warned Israel late Saturday over its continued attacks on Syria, saying that a miscalculation could drag the region into a major war. Sayyed Hassan Nasrallah made these comments in a wide-ranging interview that lasted more than three hours with the Beirut-based Al-Mayadeen TV station. Nasrallah said Iran, Syria and Hezbollah could “at any moment” decide to deal differently with Israel’s actions in Syria, such that ‘everything will become possible’. Netanyahu, who is currently presenting himself as one who is achieving victories on several fronts, and he employs his visit to the Sultanate of Oman, to Chad e.t.c, and you see how he employed the tunnels issue (for publicity purposes). Were you not the (Israeli) Prime Minister from 2011 till today? Okay, so where is your project in Syria? Why do you not be honest with your people and tell them that you have lost all your bets till now in Syria? Okay, he betted on the downfall of the regime, and the downfall of President Assad. He betted on the collapse of the Syrian army. He betted on terrorist and takfirist groups taking control over Syria. He provided them with support. Before he left, (Gadi) Eizenkot admitted for the first time that (Israel) provided weapons and ammunition to the armed groups – ofcourse medical and emergency aid to them was done publicly – however this is an official confession, (that) you provided them with weapons and ammunition, and this was a surprising (confession). Okay, you fought with them in southern Syria, and you would target the Syrian army, its bases and artillery positions, via many operations (which you would carry out) when these groups required support. And you were a part of this global war against Syria, by carrying out (various) media, political, diplomatic, security and military (activities). Your aim was for President Bashar to leave, for the regime to fall, and for the Syrian Arab Army to collapse. So, what did you achieve? Where are your people today in Syria, those whom you armed and protected? This is one. Okay, today Netanyahu has come back to say: our guarantees lie within (the strength of) our army, our borders, our (political) entity. Yet your (actions) during the past 7 years do not demonstrate this. This is the first failure. The second failure: you laid down an objective for your attacks in Syria – we’re done now with the issue of the regime’s (downfall), they failed to achieve this. You laid down an objective for you attacks in Syria: that you are carrying out raids against logistical targets with the purpose of preventing (military) capabilities from reaching Hezbollah in Lebanon, (meaning) advanced weapons and high-precision missiles. Yet they had (a policy of) ambiguity, they would not admit (responsibility), yet (Netanyahu) and Eizenkot, why am I focusing on this issue? Because they were using (these raids) in the media and politically, for personal interests, and for the sake of the (Israeli) elections. When he says ‘we carried out 200 airstrikes’, one moment he says 200, later he says 400. What’s the result? You were unable to prevent the required (military) capabilities from reaching Lebanon. So you failed. So you also failed (on this point) in Syria. You can carry out airstrikes, but that doesn’t mean you are achieving anything. Anyone can carry out airstrikes. Okay, the third objective which you declared: removing Iran from Syria. And you went an endless amount of times to Moscow, and you exerted all your influence in America. To the extent that the Americans made their withdrawal from Syria (conditional) to an Iranian withdrawal from Syria. And you failed. Okay tell me where are his achievements in Syria which he is boasting of? Yes, today there is something in Syria, if I wish to make a quick assessment I would say: all the hopes of the Israelis have been lost in Syria, and all their (strategic) policies have failed, and all that they carried out from 2011 till today have not led to any result. And this is Syria and its army rising up once again, and to the contrary, its air defence has become stronger, its army is more experienced, and Syria will regain its prosperity, and it will be rebuilt, and it will become better than what it was God willing. And despite all the pain and wounds it has suffered, it will not relinquish its pan-Arab responsibilities. Okay, there remains one issue. He is coming and saying: via military power I wish to force Iran out of Syria. And this is not a new aim. He has been working on it for several years, and he failed to achieve it. Meaning up until now, he failed politically to remove Iran, and he failed militarily to remove Iran (from Syria), by carrying out all those airstrikes under various pretexts, and ofcourse they would not claim responsibility for them. Okay, where does Netanyahu wish to go on this issue? What occurred in the last few days in Syrian airspace, is a huge development, there is no doubt. It is for this reason that I said earlier that (Netanyahu) must be very careful, he must not miscalculate. At any moment a decision could be taken – because I do not wish to say that a decision has already been taken – at any moment a decision could be taken to deal differently with Israeli attacks on Syria. – Nasrallah: By Syria, by the Syrian leadership, and by the Resistance Axis as well. Why should I tell (Netanyahu) not to miscalculate? You may tell me what has changed now? (Netanyahu) has been for one month, two months, one year, two, three, and four years, launching strikes (on Syria) and the situation remained the same. Ofcourse keeping in mind that he (was) launching strikes, but he was also being careful of some rules of engagement, up until now even. For example, (rules of engagement) regarding Hezbollah, and the Iranians: when he killed our brothers in Quneitra, an Iranian brigadier general was martyred with them, the Israelis got up and said we did not know there was an Iranian, meaning that they were saying ‘we do not wish to kill an Iranian’. ‘We killed some (fighters) from Hezbollah and the response came from Lebanon’. (Netanyhu) is careful not to kill (our men), because we are committed to responding to them from Lebanon. And even when (the Israelis) target the Syrians, they are trying not to cause (Syrian deaths). One must be objective, sometimes when there are Syrian martyrs, these martyrs are from (the ranks of) the officers and soldiers of the air defence who are directly confronting (the attacks). Even the Iranians, I remember only one instance when martyrs fell for them – at the T4 (Airbase). – Host: Yes, martyrs fell and the Iranians responded. 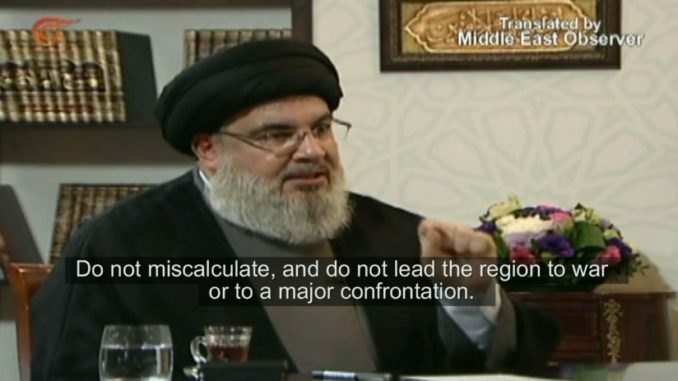 – Nasrallah: You know what occurred thereafter. Okay, today you may say what has changed? Well firstly, in the past the priority of everyone was not to enter into a large problem with the Israelis in Syria, the priority was ending the conflict within (Syria). (Today), it is true that the internal conflict has not ended, yet we are now in our best situation. This is a change (that has occurred), Netanyahu and his aides must be careful of this. This is a very important and major change. And I know what exists in Syria: I know the current state of morale, spirits, logistics, the battlefield, the capabilities, and the circumstances, the situation (today) is completely different to the past, even when comparing to 2018, let alone 2017, 2016 e.t.c. The second important change is that even the Syrian army has recollected itself to a very large extent. The third major change is the Syrian air defence and its ability to (defend), which has greatly increased. Even the Russian element, some may look at it from a negative angle, yet some may also look at it positively, because the Russian element could provide some type of leeway for the Israelis, yet (the Russians) cannot provide them with too much room to manoeuvre. Okay, even when it comes to our axis, today in Iraq it is comfortable. Daesh is finished. Even in Iran, what Trump was waiting for on the 14th of November (2018), that is the date when the sanctions come into effect, (Trump) himself was saying that millions will go down onto the streets and the Iranian regime will fall. Iran absorbed the issue – even a small demonstration did not occur. Therefore, despite the sanctions Iran’s situation is good. Our situation in Iraq is good, our situation in Syria is good, our situation in Lebanon is good in general, at least from the strategic viewpoint. Thus, there are important developments, and for this reason all the current assessments by the Israelis, by their senior generals and institutes which they hold in high regard,, (all of them say that) the strategic environment of the region is different to what it was the year before, and all the years prior. And they tell (Netanyahu) that war is dangerous, and that war won’t be (fought) on one front or (against) one side, but rather, war could be fought against us on all fronts, and that the (Israeli) internal front will suffer huge and serious (damage and casualties). They need to take into account all of these changes in the strategic environment. Ofcourse, our axis is also taking all these (changes) into account. The key point which I wish to say – because time is beginning to run out – the key point tonight is a message to Netanyahu: you must be careful if you wish to continue carrying out what you are doing in Syria.. Do not miscalculate, and do not lead the region to war or to a major confrontation. Syria is defending itself, whenever it is attacked it defends itself, but the question is whether there will be a response or not, is (the lack of response) tied to a political decision or military inability? Secondly, when we speak about a political decision, is it an independent decision (of the Axis), or is it because of – I won’t say influence or pressure – but a Russian wish for a response not to occur? – Nasrallah: It is a political outlook, a political decision based on the organisation of priorities during that stage. – Host: So it is not an inability militarily speaking? – Nasrallah: No it is not an inability militarily, not at all. (It is based on) a political decision that is organising priorities. – Host: An independent decision? – Nasrallah: Yes, but first of which (in this Axis) is Damascus, it initiates the taking of the decision. – Nasrallah: Everything is possible. At a particular moment, everything is possible. – Host: Does the Resistance Axis study this issue strategically today? – Host: Currently are you communicating, evaluating, and discussing this issue? – Nasrallah: Ofcourse, we carry out communication, evaluations, assessments, forming conclusion and a revaluation of (our) stance. – Host: And what you said moments ago, that Netanyahu must be careful, as the (Resistance) Axis may respond, you are speaking on behalf of the Axis, and not as the Secretary General of Hezbollah (only)? – Host: And the public who have been asking about this, I believe they now have a clear answer today.